In each election, independent candidates stand for seats in the national and provincial assemblies. They pitch themselves as outsiders rebelling against what they say are decadent and corrupt political parties. But then something strange happens when these independents make it to power. Post-election, many of them are only too happy to be absorbed by mainstream political parties they rejected during their campaigns. SAMAA Digital looked at the absorption rate using data from the Election Commission of Pakistan. Between 2013 and 2018 around 65% of independent candidates for the National Assembly were absorbed. This means that they started out as independents in 2013, but by the end of the government’s five-year rule, they had joined political parties. A grand total of 96 independent candidates were elected in 2013 in all assemblies and at the Centre. This number dwindled to 19 by the end of five years, showing just how many had abandoned their independent status. Only 19% of the original 96 candidates had decided not to align themselves with any political party. When measuring this absorption or ‘defection’ at an assembly level, Punjab had the highest number of independent defections. Of the 40 candidates who were elected, only five stayed neutral. 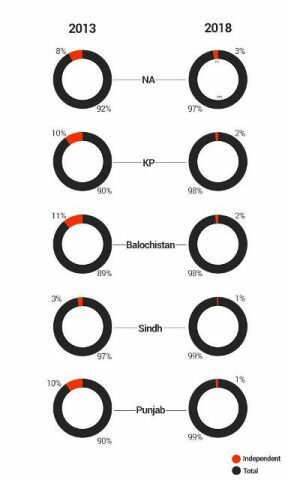 In Sindh, only 3% of the elected representatives stayed independent. In these elections there are a number of well-known politicians contesting independently. Former interior minister Chaudhry Nisar Ali Khan will be contesting the elections as independent candidate from NA-59 Rawalpindi, NA-63 Taxila, PP-10 and PP-12. Former MNA Shamsur Rehman left the PTI because of its “unfair” ticket distribution. He will now contest elections as an independent candidate from NA-34 Lower Dir. Social activist Jibran Nasir will also contest the elections as an independent candidate from NA-247 Karachi and PS-111 Karachi. Sunita Parmar, a member of the Meghwar community, became the first woman to file her nomination papers for the Sindh Assembly seat in PS-56 Islamkot. She too is an independent candidate. Former federal minister for religious affairs Hamid Saeed Kazmi also announced that he will contest the 2018 general from NA-175 as an independent candidate.